This incredibly comfortable flagship model has excellent heat retention and is very lightweight. This model is perfect for summer trekking and camping. Fill power refers to the volume in cubic inches that 1 ounce of down will displace. All other things being equal (fabric, construction method, and fill amount), a product made with high fill power down (900) is lighter and more compressible than an equally warm one made with lower quality down (550). 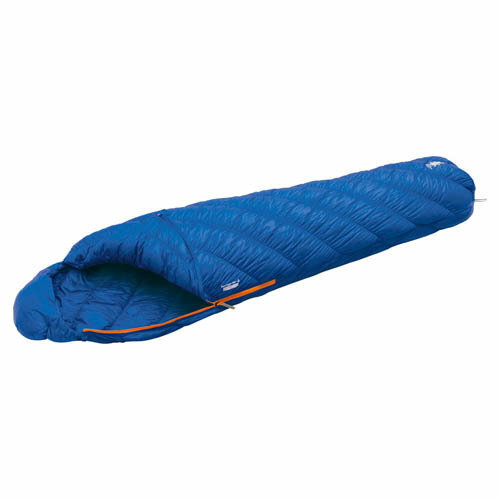 By orienting the fabric’s warp and weft threads at 45 degrees to most major seam lines the sleeping bag becomes more fluid or elastic in nature. Additionally, to create an even more comfortable system we utilize an elastic stitch technique to create small “gathers” in the quilting. By combining the strategic seam orientation and the elasticized gathers we offer unrivaled fit and comfort. Ballistic Airlight is made using the same nylon polymer as our Ballistic material and a highly technical production process to create extremely fine, super thin threads. These threads are then woven into ultralight, gossamer fabrics that share the same characteristics as Ballistic: one and a half times more abrasion resistance than other similar weight fabrics and boasts three times the tear strength of nylons that are almost 20% heavier. Additionally, Ballistic Airlight is often woven using different techniques to create fabrics with radically different characteristics, such as fabrics that allow the garment to stretch or fabrics that "breathe" to release built up heat and moisture. Compared to standard water repellents, POLKATEX is world class water repellent due to its lasting durability. POLKATEX not only repells light rain easily, it also has oil repelling properties making it resistant to staining as well. Montbell's original application technique prevents POLKATEX from peeling off due to abrasion or washing, two of the most common reasons a standard water repellent will wear down over time.